In June, Bordeaux’s vines are typically in full flower. But in late June 2011, the vines seemed almost a full month ahead of schedule. You can read my related articles in decanter.com here and here. The small bunches of flowers that normally develop around the beginning of the month were actually already there in May. That’s when pollination occurred. So every June, Bordeaux throws a huge party. 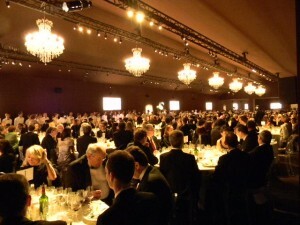 Although the Fête de la Fleur occurs every year, it is only a huge event every two years, on the occasion of Vinexpo. 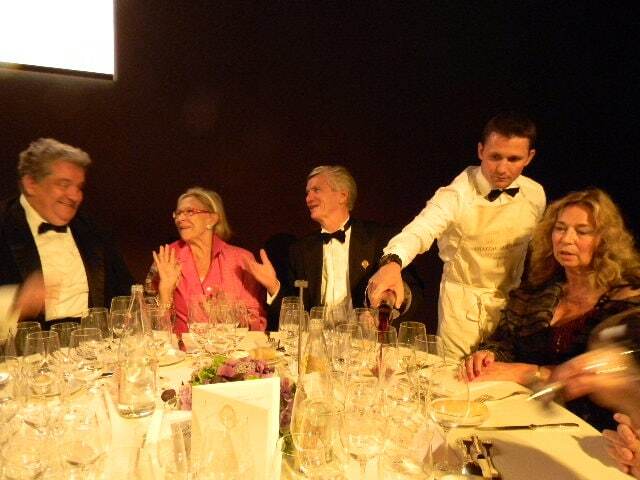 How could I forget the Fête de la Fleur in 2003 at Château Mouton Rothschild, where we drank 1982 Mouton Rothschild, heard Placido Domingo sing and were entertained by fireworks? world. 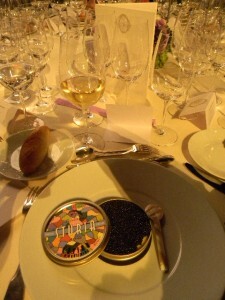 Champagne and white wines were served. I headed for one of several oyster bars along the château’s sprawling lawn and chatted with fellow Decanter writer Jane Anson and her husband Francis. 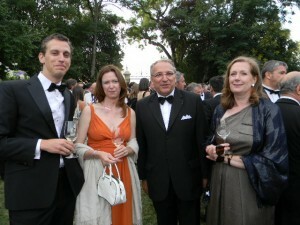 The only thing that this event had in common with the Domaine de Chevalier shindig were the oysters. Yum. Just a "small" part of the dinner gathering! Many thanks to the Meslier Family of Château Raymond Lafon for the invitation. 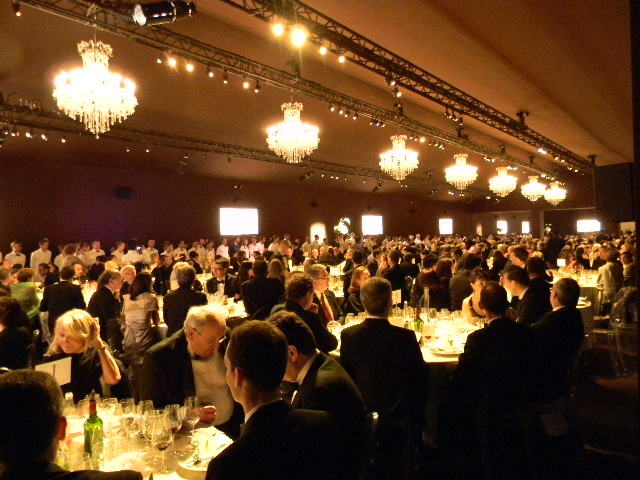 We met at table number 8 in one of the two immense spaces for the dinner, which was delicious – especially when you take into consideration the fact that chef Eric Fréchon, who boasts three Michelin stars, had to orchestrate the menu for some 1,500 guests. Incidentally, as a sign of the times, the menu was in both French and in … Chinese! Although the wines were far too young, Fréchon managed to arrange fine pairings. Take for example the Aquitaine Caviar over mashed potato flavored with haddock: we drank insanely young Haut Brion 2006: from 120 magnums, no less. I think this dinner alone raised the price even further into the stratosphere. It was served too cold, but I could understand when you have to serve some 1,500 guests. As it warmed up a bit, resin and pear on the nose, with a certain lanolin richness on the palate, a full-bodied feel, yet elegant, although I was wondering if it could have been more precise? A very fine vintage of course, but I doubt it is as good as the 2007. 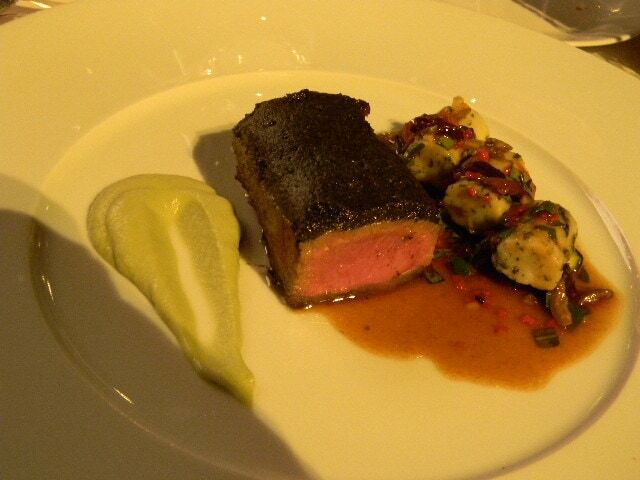 A double magnum of this – photo above – would easily cost $1,000 if not more at retail so who am I to complain? Then came saddle of lamb with a nori pepper crust, accompanied by herb flavored gnocchi and pureed hohlrabi. What did we drink, you wonder? 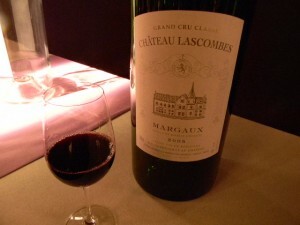 Château Lascombes 2005, from imperial bottles! Now, what was this? I was half expecting a barrel tasting experience given such a large format from such a recent vintage, and I sort of got that. But I must say that this wine impressed me more than I was expecting it to. Yes, the oak derivation was there, but I also enjoyed pure cherry and cassis aromas and flavors. And it was not just dark black fruit, as one might expect from a “modern” wine. No, this had a citrus zing to it, too. The intensity on the medium+ bodied palate was high, but in a good way, with much sap, and promising oak integration. I liked the nose as pretty overall. Could one make a possible reproach? 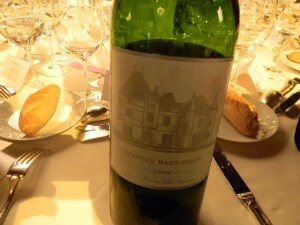 Some others who also enjoyed the wine did not see this as a Margaux but more as a St Julien. Perhaps. But it was darn good. It actually went well with the lamb, although the ensemble was a tad over salted. 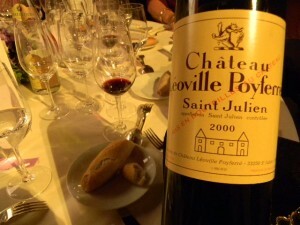 Next came the Château Léoville Poyferré 2000. I had just been at Léoville Poyferre that afternoon to taste several vintages including a delectable 1999 and a still sturdy 2002, but this was better than both. Although our first bottle was a bit faulty, lacking freshness, the second bottle had much more verve and flavor intensity, showing off plenty of richness and pleasing flavors. Although I liked the cheeses – a brie with truffle filling and a Saint Nectaire – I would have preferred them with a white wine. In any case, this should have been the youngest wine at this dinner, not the oldest! But again, how can I possibly complain? 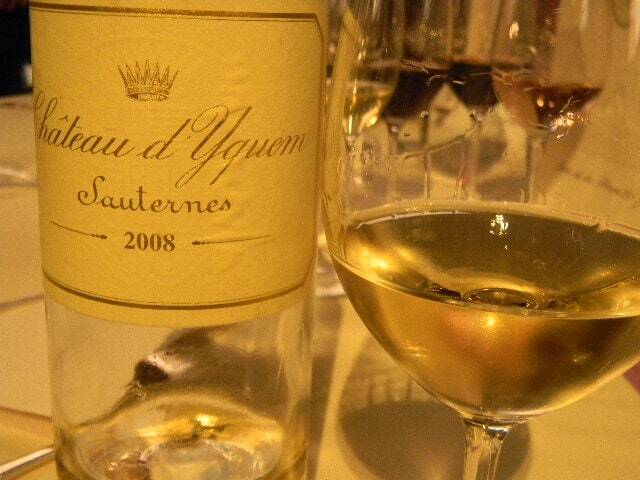 We ended things with Château d’Yquem 2008! Infanticide! But it was delicious. Along with the Lascombes, I think I enjoyed this best among the wines. The nose revealed vanilla wafer and peach and pear aromas, with a hint of grapefruit freshness that came through more on the palate. Served far too cold, it was important to wait at least 20 minutes for the wine to warm up in glass, as it was a cool evening, too. A superb Sauternes, if waaaaaaay too young! 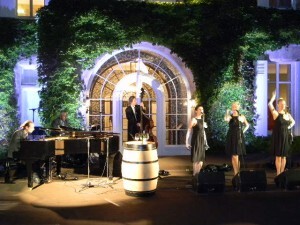 Estimated cost for the night (split amongst chateaux): $1.35 million. 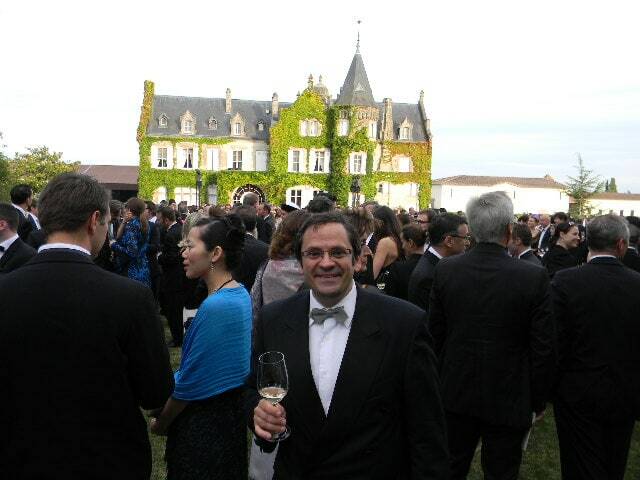 Mr Thomas Barrack, Chairman and Founder of Colony Capital, then still owner of Château Lascombes, had made a special trip from the United States to attend this event. Château Lascombes, Classified Second Growth of Margaux in 1855, is managed by Mr Dominique Befve and had been owned by the group Colony Capital since 2001, only to be sold to a French health insurance group this month (July 2011).